The good news is that the HTC Thunderbolt will be one of the first devices on Verizon’s new 4G LTE network to utilize Skype’s new video chatting feature and also act as a mobile hotspot for up to 8-devices. The bad news is that it won’t have either at launch according to information we just received from Verizon. As you can see in the shots above, the hotspot feature will be unavailable initially which means we have no idea when it’ll be ready. Skype’s video chatting on the other hand will look like it’s pre-installed on the device with a placeholder icon, but users will have to wait to be notified before they can actually access it via download from the market. We’re not sure if both apps that control these features aren’t ready, or if we should pull out the i*hone theory that we’ve been working on for a couple of days now. Any chance you’d buy an argument that certain features would be held back as to not compete with Apple’s phone that is scheduled to come out just 2 weeks before the Thunderbolt? We’re not usually one for conspiracy garbage, but the shot above also mentions again that the TBolt does simultaneous data and voice over 3G, but that reps should not be using it as a selling point. Maybe it’s just all one big coincidence. We should make it clear that if you are due for an upgrade that none of this news should be holding you back from purchasing one. 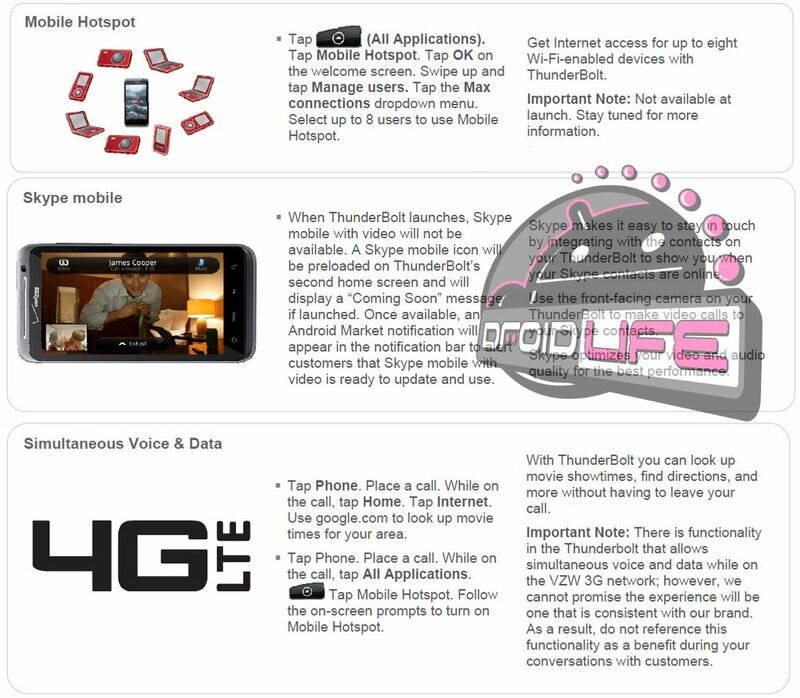 The Thunderbolt is going to be one of the best devices on Verizon for a long time and these features will all be there within no time, we’ll just assume they had a couple of setbacks. DROID BIONIC Also Makes Amazon Debut at $149?